Under Acknowledgements add: This work was partially supported by a NORC Center Grant # P30DK072476 entitled “Nutrition and Metabolic Health Through the Lifespan” sponsored by NIDDK. 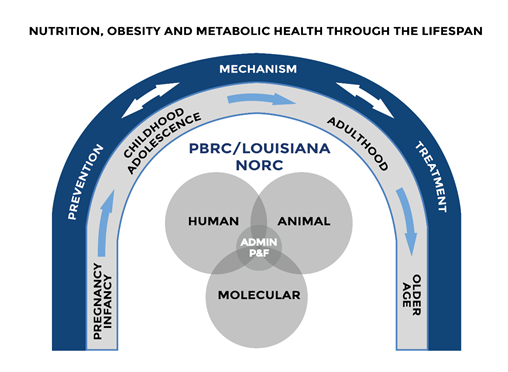 Over the past ten years, the Pennington/Louisiana NORC has conducted research covering the biological and environmental determinants of the energy balance equation as well as the relationship between obesity and cardio-metabolic health. We are now poised to emphasize more the general theme of “nutrition and metabolic health through the lifespan” with emphasis on mechanisms, prevention and treatment modalities at each step of the lifespan (see Figure). Like most of the NIDDK NORCs, our research base is related to the metabolic impact of nutrition on health and diseases. These three research foci will lead to the formation of Research Teams to address big research questions from the basic science level, to clinical investigation and finally to the population in a translational way. In each of these teams, research will focus on the mechanisms involved in health and disease, the study of treatment intervention and the implementation of preventive strategies.